We are now in the middle of Eat Local Month – how’s everyone doing? When making the commitment to eat local, the first place we tend to look is at the vegetable gardens in our backyard and whatever’s spilling off the table at the grower’s market. However, eating local does not mean a month of vegetables. Here in Nevada County we’re extremely lucky to have several organic chicken farmers that can provide you with all the eggs and chickens you could possibly eat. In addition to that, we have Grass Valley Grains, a small farming and milling business that produces flour, rolled oats and polenta, along with a few other things. I’ve discovered that polenta has an undeserved reputation for being difficult. If you can boil water and stir, you can make polenta. It’s really that simple. This week’s recipe is baked, so you don’t even need to stir. If you have been curious about trying polenta, this is a very low-fuss way to experiment. I can guarantee that it will turn out fine. Polenta is a corn dish that originated in Italy with other starches and really took off after Columbus brought corn back from the New World. It was long considered a peasant food, but in the past few years it’s become a more gourmet item. Polenta can be served soft like porridge or chilled, cut into squares and grilled or pan-fried. This week’s version is somewhere in between. Polenta also takes four cups of liquid to one cup of grains, so it’s a very economical option. 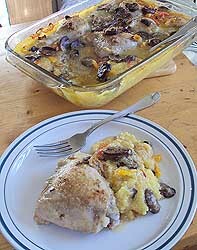 To start, put a cup of polenta in the bottom of an oiled casserole dish (a 9×13 pan is ideal), then add four cups of water or chicken stock. If you’re using water, be sure to salt the polenta. For all it’s charms, polenta can be very bland. The good news is that pretty much any seasoning you feel like adding will stand out just fine. Chili pepper, rosemary and chipolte powder are all great with polenta – just not at the same time. Set aside the polenta and liquid and brown three to four pounds of skinned chicken pieces in hot oil. Add them to the casserole dish. The recipe below calls for a whole chicken, but as long as you use bone-in chicken, the parts don’t really matter. The bones add extra flavor that shouldn’t be missed. Once the chicken in browned, add mushrooms to the pan and saute them until they are soft. More oil may need to be added at this point. Add a little wine and flour to make a sauce, then pour everything over the chicken. I added bell peppers to my dish, but whatever vegetables are handy will work too. Peas, green beans, chopped tomatoes or chunks of squash will all go great in this dish. Once everything is assembled, bake it uncovered for forty-five minutes, or until the chicken is done. This can also be assembled ahead, covered and held in the refrigerator until it’s time for baking. I don’t recommend freezing it uncooked, since polenta frozen and thawed in water can behave in unpredictable ways. Once everything is baked and cooked through, serve hot with a green salad. 1. Preheat the oven to 350 F. Coat a 9×13 baking dish with cooking spray or oil. 2. Spread polenta over the bottom of the pan and cover with stock or water. Add 1 teaspoon salt if using water. 3. Remove skin and fat from chicken and sprinkle with remaining salt, paprika and pepper. 4. Heat oil in a heavy skillet over medium-high heat and brown the chicken, a few pieces at a time. Place the chicken in the baking dish with the polenta. Arrange the vegetables around the chicken. 5. Add the mushrooms to the skillet and saute for 3 to 5 minutes until lightly browned. Add the flour and stir until flour is slightly brown. Add wine and rosemary. Stir together, then spoon the mixture over the chicken and vegetables. 6. Bake, uncovered, for 45 minutes or until the chicken is cooked through and the polenta is done.